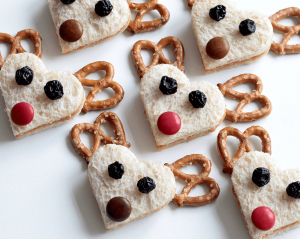 Bring the joy of Christmas to your kids with these Reindeer Sandwiches. Quick and easy, they are a stress-free way to add some fun to your Christmas feast! Simply use a heart shaped cookie cutter to cut out the sandwiches (made with your choice of filling, we used Peanut Butter). Decorate with Pretzel Bows for the ears, a Chocolate Button for the nose and Raisins or Dried blueberries for the eyes!